Little did I know some weeks ago when I booked a room at Hotel Ranga that I would have an eruption outside my window. 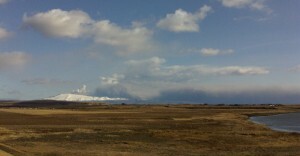 The hotel is ca 20 km from Eyjafjallajokull, the glacier now erupting and putting Europe to a standstill. I left Reykjavik this morning. 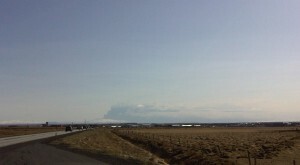 I didn’t realise it at the time but the top of some clouds, visible from Reykjavik, were indeed the top of the plume. 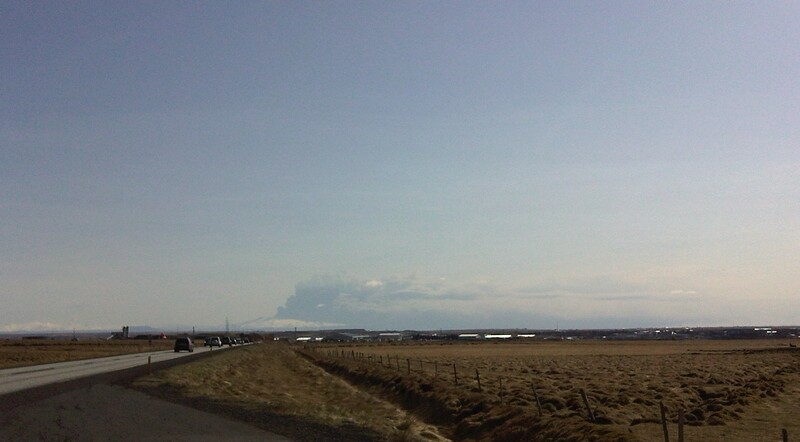 Already on the heath East of Reykjavik the glacier and the plume hovering over it were visible. Below are photos that I took as I approached the volcano. Eyjafjallajokull seen from Selfoss, ca 50 km from the volcano. 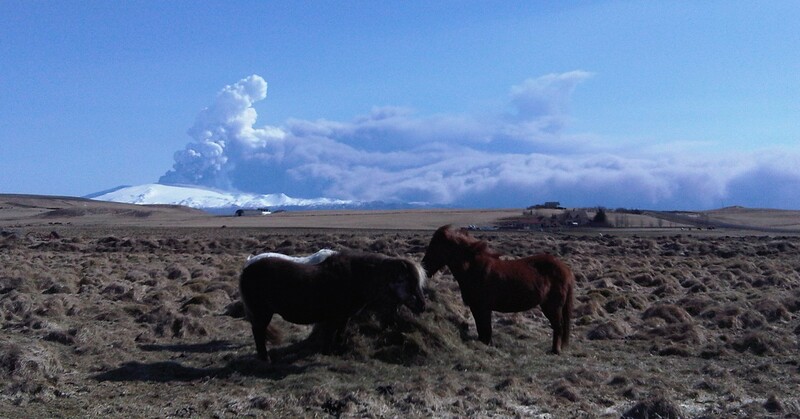 The horses didn’t seem to mind the volcano ca 20 km away. It’s a cold day today but the air clear and the view spectacular. The volcano is ca 1500m high, the steam and ash around 8km. … but only while the volcano took a deep breath: ca 20 min later it was spewing ash and steam again. The dark blanket to the right is the plume of ash that drifts over the sand South of the glacier and then out over the Atlantic, over to Scotland, England and down the continent. 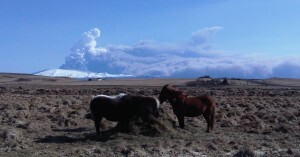 This is only a small eruption on Icelandic scale – and yet it’s powerful enough to halt the life of millions of people all over the world. A friend in Paris was going to a concert tonight but the concert was cancelled because the orchestra from Lisbon hadn’t been able to fly to Paris. Another friend is stuck in Cincinnati, can’t get back to England. But here, close up to the volcano all is peaceful, the view is spectacular and it’s as if nothing had happened except nature following its course. Subscribe to comments with RSS or TrackBack to 'Under the volcano – the source of the ash'. Thanks so much for this… in English so I can read it, no less! What a window view. And I love the closing joke… I may steal. Aw, come on, what a ridiculous exaggeration! Life HASN’T halted here in Europe. Almost everything is going on as usual. After all, most people can easily live without making an air travel for some weeks. Some tourists were having problems getting back home, resulting in detours and crowded trains, that’s all. Thx for your conerns, but it’s only passing ash, not a damaging bash! I guess it will be gone in a flash. It is really a horrible moment in time for the airline sector, nonetheless our prayers – even if the photographs of the volcano are genuinely beautiful – really need to be with those persons trapped very far from home.Many thanks for your posting.